Ueberschall’s original Elastik-based Indie Rock library got a five-star review back in the January 2012 issue of SOS. A year or so on and the company are back with a follow-up, the suitably titled Indie Rock 2. This companion title follows the same construction-kit format but, in line with some of Ueberschall’s other recent releases, the balance has shifted slightly towards depth rather than breadth. The 3GB of samples are thus spread across just 10 construction kits, but within each kit you get both a larger number of sub-sections (suitable for intro, verse, chorus, break, outro), and within each sub-section a greater number of individual loops. The result is more control over your mix options and the ability to create more varied arrangements. Like the first release, the content of Indie Rock 2 is musically spot-on. In rather too little time, you can piece together any of the construction kits into a radio-friendly indie-rock backing track. Add in some suitably full-on lead vocals and anthemic backing vocals, and this material would fit into any current rock radio playlist. The playing is top-notch and includes some great up-tempo, runaway drums with lots of splashy cymbals and simple, but very solid, basslines. However, the highlight is the guitar work that catches the genre just right: heavy, energetic, a little spikey; definitely at the ‘rock’ end of indie, but not ‘heavy rock’ and with enough melodic elements to keep things interesting. Sonically, things are also in the right ballpark. However, as well as the usual combination of both a stereo drum mix for each construction kit sub-section and the individual drum mics (so you can easily re-balance the drum mix if you wish), Ueberschall have also included DI’d guitar loops this time, as well as those from the miked-up amps. Personally, I think this is an excellent addition, as it means you can add further variety by applying your own amp-modelling plug-ins to customise the guitar tones. This does, of course, allow for some extra tricks, such as switching between clean and overdriven versions of the same part for impact, or creating dual guitar parts by using different amp tones panned left and right. There are obvious constraints when working with any construction-kit-based samples, the most significant being that you are working with the same loops as everyone else who has purchased the library. 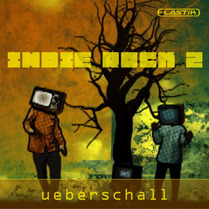 However, within that limitation, Ueberschall have done pretty much everything they can with Indie Rock 2 to give you the scope to build your own take on the basic elements. Add a few of your own guitar layers and top-notch vocals, and you can make them more your own. For those looking to build convincing indie-rock tunes in a flash, Indie Rock 2 is just the thing.